﻿Are you having more and more trouble reading books, labels, your phone, or anything else that has small type? Do you spend most of your day staring at a computer screen? Have you started to find that vision intensive activities such as driving, computer work, and reading are tiring you out? Are you trying to improve your ability to see while playing sports or engaged in outdoor activities? If you answered yes to any of these, The 15 Minute Fix: VISION is here to help. This book will teach you to use eye exercises to slow the deterioration of or even improve your vision, reduce eye strain, and help your brain better interpret the information sent to it by the eyes. 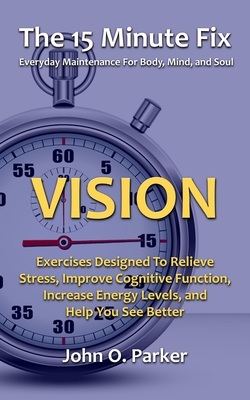 ﻿﻿The 15 Minute Fix: VISION﻿﻿ - Exercis﻿es D﻿esigned To Relieve Stress, Improve Cognitive Function, Increase Energy Levels, and Help You See Better is available in print and as an eBook (optimized for easy viewing on a smartphone). Curious? Try one of the books from the FOCUS series (NEAR VISION, FAR VISION, DEPTH PERCEPTION, and SPORTS VISION) or submit your email and I'll send you 5 free exercises from The 15 Minute Fix: VISION. VISION - Eye exercises to help improve vision, alleviate eye strain, and keep your eyes youthful and vibrant in just 15 minutes a day.